East of the Don Valley Parkway, just south of the Danforth, is the quiet, tree-lined neighbourhood of North Riverdale. This picturesque community hosts an abundance of beautiful homes, reputable schools and large parks, making it little wonder the area is so popular among families. The warm communal feel here wouldn’t be out of place in even the most welcoming of Ontario's small towns. That’s why it’s so surprising North Riverdale is close to the downtown area of Canada’s biggest metropolis. Architecturally, the area is a mish-mash of old and new. Old-fashioned Edwardian and Victorian houses stand next to modern townhouses and towering condo buildings, which have infused the neighbourhood with a youthful populace. The surrounding regions of North Riverdale provide awesome amenities that can be reached by foot. Greektown on the Danforth, for example, is full of family-owned eateries and boutiques, while East Chinatown lies just to the west. Heading south will take residents to Queen Street East, home to some of the hippest stores and restaurants in the GTA. Whether you prefer to get around on foot, bike or the transit system, North Riverdale will accommodate your tastes. It scores a 90/100 Walk Score, meaning you can find entertainment and complete errands without difficulty. In the case of North Riverdale, that high score also comes with some beautiful scenery to make your walks more pleasant. The Transit Score for North Riverdale is a sparkling 98/100, thanks to its proximity to both the Broadview streetcar and the Bloor-Danforth subway line. There are also streetcars servicing Gerrard and Queen, plus buses running along Pape, Jones and Greenwood. If you own a vehicle, the nearby Don Valley Parkway will make it easy to move north-south, and provides a quick route in and out of the city. 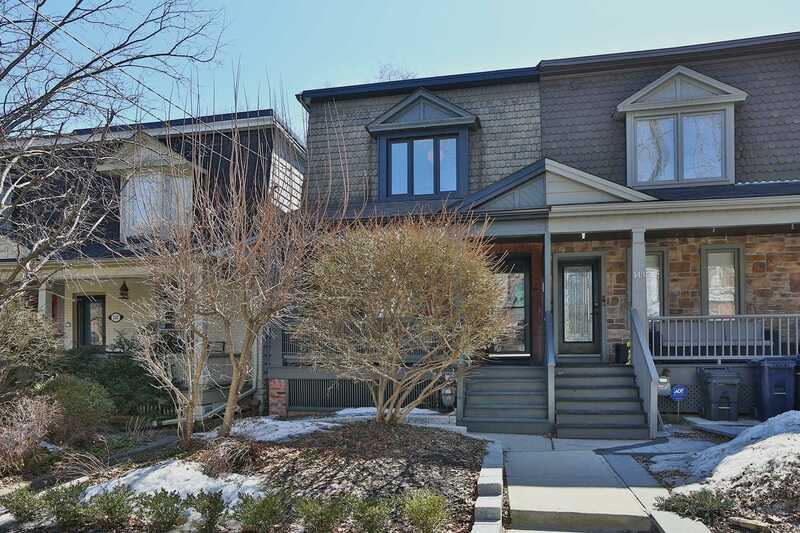 North Riverdale is home to a majority of mid-to-upper class families, and there’s a good chance your neighbours will be a couple with some children. In some cases, the kids will already have flown the nest. If you live in an apartment or condo, you’ll see the full gamut of humanity, with demographics skewing much younger than for detached structures. The following data was obtained from the 2016 North Riverdale neighbourhood census profile, and the City of Toronto Ward 30 profile. Average prices are determined by the realestatecondos.ca listings. There are numerous retailers occuying North Riverdale, but Danforth Avenue is the primary shopping district. There you’ll find lots of specialty shops, as well as familiar names, like Shoppers Drug Mart and Loblaws. One popular shop is Ten Thousand Villages, which is a must-visit for eco-friendly, socially-conscious folk. You can find a wide variety of fair-trade items, including handmade jewelry, clothes and nicknacks, to name but a few options. Another good place to shop is along Gerrard Street, where you’ll find Pop Music, a vinyl shop that caters to all musical tastes. Another cool place on Gerrard is The Brides’ Project, which takes and sells used bridal gowns, giving profits to cancer charities. The main benefit of living beside Greektown is the food. Take Mezes for example; getting a seat is competitive, but the place has big, shareable dishes, homemade desserts and a robust wine list, so your taste buds will thank you for waiting. There’s also a lot of options for other cuisines. Good Things, for instance, serves up a fine mix of health and taste, providing a wide variety of dishes to please vegans and carnivores alike. They also create their own fresh juices, perfect for those days when you need a little pick-me-up. Coffee shops are pretty abundant around these parts, so you don’t have to go far for a cup of joe. One neighbourhood favourite is The Rooster Coffee House, which sits on Broadview right across from Riverdale Park. This sleepy little retreat has a homey feel, and even offers board games to keep its patrons entertained. From ice skating to swimming, and running tracks to play parks, there are plenty of outdoor activities to fill your time with in North Riverdale. Among the most popular options is Riverdale Farm - a historic working farm and petting zoo next to a scenic walking trail. Brickworks is another cool area worth visiting (several times). What was once a collection of deteriorating heritage buildings has been given a new lease of life, and is now a centre for green design and urban sustainability. The Evergreen Brickworks hosts a sustainable farmers market each Saturday, and is accessible by road or hiking trail. It even sets up a skating area in the winter. Though many of its amenities are natural, North Riverdale is not without urban niceties. One of the most noteworthy is the beloved Danforth Music Hall, which welcomes acts from around the globe. Originally constructed as a movie theatre back in 1919, the venue now hosts comedy shows, live bands and singers. The North Riverdale neighbourhood has a number of reputable public and private schools, many of which can be reached by foot. North Riverdale sounds like a land filled with trees and stream, and when you visit, you won't be disappointed. Riverdale Park is the largest green space, covering 18 hectares. It contains three multipurpose sports fields, a running track, seven tennis courts, picnic areas, a children's playground, and is just west of an outdoor swimming pool. In the more frigid months, you can bundle up, don your skates and enjoy the artificial ice rink, which features a hockey pad. A smaller natural retreat is Withrow Park, which is home to two ball diamonds, a multipurpose sports field, two outdoor tennis courts, a volleyball court, off-leash dog area, wading pool and a children’s playground. In the winter months there is an artificial ice rink at its centre, and in the summer months the park draws crowds to its popular Farmers Market. There are also lots of wooded areas, hiking trails and bike routes for the locals of North Riverdale to enjoy.